When you are teaching yourself to draw using books and the internet, it can be difficult to know how to improve your skills. Without a teacher to help, you may keep making the same mistakes longer than if you were in a class situation. The key to overcoming this obstacle is to learn to look at your work with a fresh, critical eye. It's only right that you are proud of the progress you make with each drawing you create. After all, there's no need to let small flaws spoil your enjoyment of drawing. It's also important to recognize your mistakes because they will help you learn. Let's explore the most common mistakes that beginners make. Some of them are small, some are big, and all can be fixed. For the best results in assessing your work, choose a few pieces that you completed some time ago. It's easier to be critical of a work that you haven't recently finished. Look for each of the mistakes listed, and choose one or two things to concentrate on next time you draw. Don't try to fix everything at once, and remember that it's more important to enjoy the drawing process than to strive for perfection. Pencils are important and can severely impact your drawing. If you have no really dark shadows and the whole picture is rather pale, check your pencil. Are you using a standard Number 2 (HB) pencil? While these can be handy for light shading, they are too hard to draw with. The Fix: The first step you can take is to increase the variety of pencils you have available. 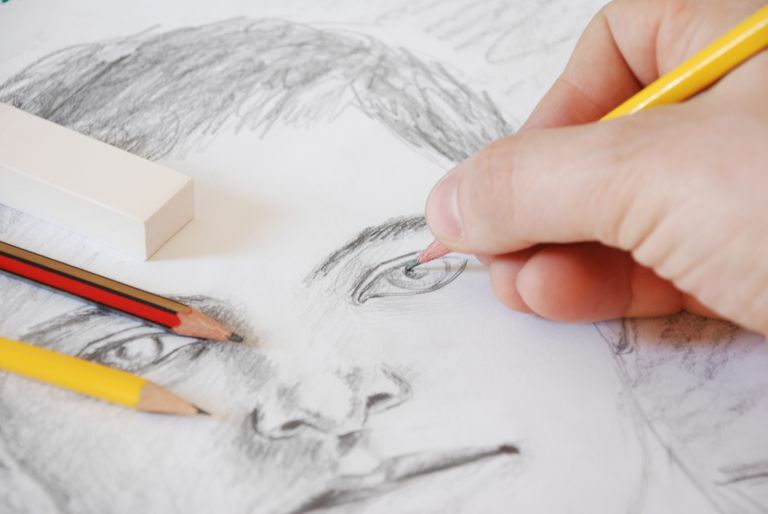 Pencils such as a B, 2B, and 4B will give you the darker values you need to add dramatic effects to your drawings. It's not a bad idea to make a small investment in a full set of graded pencils. 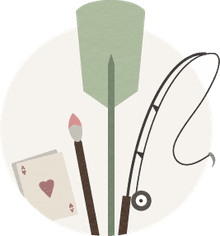 This will give you maximum control over all aspects of your drawings and allow you to gain experience in what each pencil has to offer. Using flash photography in your reference photos flattens the features of your subject and leaves you nothing to work with. This is one of the primary problems beginners face when learning to draw. When the person is facing you, it is very hard to see the modeling of their face—the shadows, highlights, and subtle gradient changes—because the perspective vanishes behind their head. Add to that a cheesy snapshot grin and you're making a realistic drawing much harder than it should be. The Fix: Have the person turn slightly to one side so you can model their face. Use natural lighting to capture good skin tones and wait for a natural expression to show their real personality. If both you and your subject are relaxed, the photo (and the drawing) will be much better in the end. Head proportions are one of the most difficult things to get right when drawing people. We often focus so much on a person's features—their eyes, nose, lips, and hair—that we draw these elements too big. This can cause you to squash the rest of their head to fit everything in. The Fix: Does your drawing look like the forehead is too small, or the back of the head is flat? The best thing you can do is take some time to study correct head proportions. Though every person is unique, we all have the same basic proportions. When you understand that a face is divided into thirds and know the amount of space to leave for the foreheads of both adults and children, you will see a lot of improvement in your portraits. The angle from which you're looking at a person will affect the alignment of their facial features. Because we are used to looking at a person straight-on, we naturally try to make their features look level as we draw. If their head is on an angle, this results in strange distortions in the picture. The Fix: Always begin a portrait drawing by sketching guidelines to ensure that the features are on the same angle as the rest of the face. These construction lines will help you place your subject's eyes and serve as a guide for keeping everything in perspective. When you take a photo standing up, you are looking down at your pet and they have to look up. From this perspective, their head seems much bigger than their body and they often have a rather odd expression. This is not the most flattering way to draw your favorite animals, but the fix is simple. The Fix: When you're taking the photograph, squat down so the camera is at your pet's level. For the most natural expressions, sit down and hang out with them for a few minutes before putting a camera in their face. If someone else is around, ask them to distract the animal so they aren't looking directly into the lens. Otherwise, just relax with them and be ready to snap a shot when you see a great expression. Your reference photos will be much better if you take some time to work with your pet and capture their true personality. Quite often, the shadows don't go past a dark gray when shading. If your value range is restricted to half of what it ought to be, you are limiting the modeling and depth in your drawing. The Fix: Place a piece of black paper at the corner of your drawing and don't be afraid to go that dark, or as close as you can get. Try practicing graded and continuous shading so you're more comfortable with building up these shadows. It will give your drawings a more dynamic range and make your subjects pop off the paper. When value drawing, you are creating an illusion with areas of tonal value. When you draw a hard line to define an edge, you disrupt this illusion. If your drawing is pale, it might be the paper you're using. Some cheap papers have a sheen on the surface that is too smooth to grab the particles of the pencil. Also, a thick notepad has too much "give" under the pencil to allow you to apply enough pressure. The Fix: Try a basic photocopy or office paper or check the art store for cheap sketch paper. You can also place a piece of thicker card stock under a couple of sheets to give you a firmer surface to draw on. If you are trying to get even shading, some sketch papers can be too coarse and result in an uneven texture. Try a hot-pressed Bristol board or similar smooth drawing paper. You have many great paper options to use for graphite pencil, so play around with them to see which gives you the best results. Whether you're drawing a landscape or placing plants behind your subject, take the time to work on the shapes of the foliage. Don't use circular scribbles to draw foliage because it looks incomplete and can make an otherwise good drawing look crude. The Fix: Use more convex shaped scumbling—like crescent shapes and scribbly calligraphic marks—to draw the shadows in and around clusters of foliage. Your trees will look much more realistic. Thin, heavily detailed things are the trickiest things you can draw. It's very common to want to draw every hair or blade of grass as a single pencil line. If you do this, you'll end up with an unnatural-looking mess of tangled wire. The Fix: Try to make feathery pencil strokes to draw the shadows and darker foliage behind areas of grass or hair. Study a ​tutorial on drawing hair and practice the things you learn, then apply it to all of those smaller details in your drawings.